Source: John Bell, Poole, Dorset. 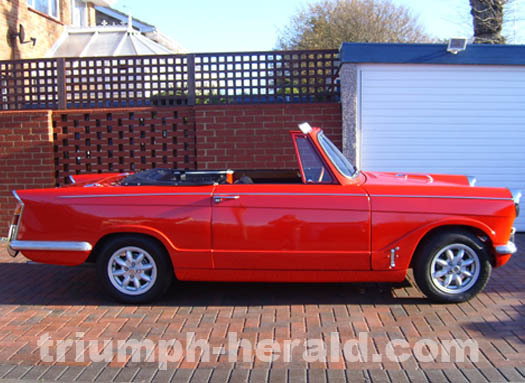 Info: My wife bought the car in 2004 for my 40th birthday present as i have always have dreamed of owning a mint Herald Convertible she bought it from e-bay for a very low price as the condition was awfull When the car was trailered to my home examination proved the car was not a true convertible and I dont think a true 948. However i deceided to have a full body off restoration carried out by Southern Triumph Services. as you can see they carried out a fantastic job also carrying out the job to my specificationsThe Car, Trixie as she is known by the local community now has a Toledo 1300 engine fitted, vittese bumpers,minilites and disc brakes fitted. She is painted in Ferrari chiaro Rosso a lovely deep shining red that alows the car to reach a speed of 197 MPH.